Giving the boot to the Stick! Beer (Ancient Iraq 6000 BC), the wheel (Mesopotamia 3500 BC), candles (China 300 BC), numerical zero (India 900 AD), the printing press (1450 AD), toilet paper rolls (America 1877 AD) and the World Wide Web (Switzerland 1989 AD) are all on the list of World�s Greatest Inventions. Fair enough, I reckon. After all, where would we be if the geniuses at the Albany Wrapping Paper Company hadn�t come up with their �perforated, medicated, rolled toilette paper�? Still resorting to using a bunch of leaves for our morning ablutions, I guess. However, I think that there is one obvious great invention missing from such a list. One so commonplace we often overlook its ubiquitous usefulness. And that is: the Stick. Of course, I�m not referring to any old lump of wood. A Stick needs to possess certain characteristics to be worthy of that label. For instance, it can�t be too long or too short; it must be just the right length to do the job required of it. Typically, that job is where you have something with a �Point A� and a �Point B� and the need to keep the aforementioned points separated by a distance precisely equal to the length of the Stick. If you also have a �Point C� needing to be brought into the equation, it is possible to use multiple Sticks to achieve your goal, but I will leave advanced Stick usage for another day. Used properly, a Stick can hold things up, hold things down, hold things apart and in a pinch (pardon the pun), lever things out. You can also use a Stick to prod things, but that�s certainly not for amateurs. I have a friend named Col (lawyer by profession, hippy by nature) who has just returned from Tasmania where he and his wife Shirley ran a Bed and Breakfast. Every so often, just for fun, Col and Shirley would head off and work as seasonal fruit pickers. On one job, Col struck up a great friendship with a vineyard owner and so was entrusted with the job of �Stickman�. This entailed standing by the conveyor belt and using a Stick to prod any fruit that got stuck on its way to the crusher. So, while Shirley toiled away in the vineyard under the hot sun with the other pickers, Col sat steadfastly at his station (in the cool shed) with his trusty prodding Stick which he used to persuade recalcitrant fruit. As I mentioned before, prodding is not a job for amateurs. Sticks occasionally even find an automotive use. 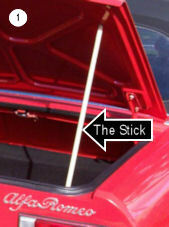 Indeed, until recently, a Stick performed a very important job on my Alfa Spider. It lived in the boot of my car and its sole purpose was to keep the boot-lid open when I needed to put things in or take things out (Figure 1). This was necessary because my much loved and used vehicle had, at some time in its past, suffered a failure of (to get technical for a moment) its boot-lid-holder-upper-thingy. By way of explanation as to how this sad event came about, a brief discourse on the derri�re of the 105 Series Spider is required. Kamm-tail Spiders have quite a generous boot, not exceedingly deep, but wide and long. Which means that the boot-lid is quite large � larger than some car bonnets these days � and thus reasonably heavy. To ensure the boot-lid stays up, Alfa Romeo designed an ingenious and engineeringly-elegant system of brackets and torsion rods. This arrangement occupies minimal space, is quite neat and works a treat. 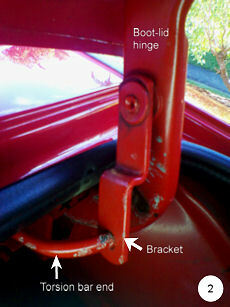 Each boot-lid hinge has a pivoted cranked bracket (Figure 2) that connects to a torsion bar running the width of the boot, tucked up out of sight under the rear valence behind the seats. 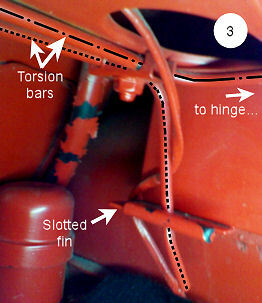 The opposite end of each torsion bar fits into a slotted fin (figure 3), allowing the amount of torsion to be adjusted to suit. Unfortunately, on my Spider, the left-hand bracket was completely missing which meant that the corresponding torsion rod was unattached and, therefore, deciding lacking in actual torsion. Now, I think it is fair to say that there are few automotive companies that can match Alfa Romeo for moments of sheer engineering brilliance. Many times I find myself in awe at Alfa�s approach to design and engineering for a specific problem. Their solutions often take an unusual approach, yet the end result is surprisingly simple and elegant. It is, therefore, such a shame when the execution is flawed in a small but important detail, rendering the whole exercise eventually futile. Perhaps Alfa designs by union-organised committees, in the spirit of democracy. Everyone at the factory gets a part to play but invariably the Accountants end up skimping on their component to cut costs. 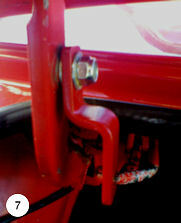 If that is the case, then the Accountants got to decide how to attach the bracket to the hinge on Alfa Spiders. Or maybe it was the work experience kid. Anyway, whoever was responsible decided it would be just fine to use an oversize rivet for the boot bracket pivot-pin. Now, as I mentioned, the Spider boot-lid is quite large and relatively heavy and so the amount of force needed at the hinge to keep that weight counterbalanced is considerable. That�s ok, because you can get quite a bit of stored torsional energy when you apply a twist to a length of spring steel. Naturally, torsion, being a twisty, bendy type of force, tends to try and twist and bend the thing to which it�s attached. Unfortunately, having a rotational, twisty, bendy force working away at the peened-over end of a oversized rivet is not a recipe for longevity. 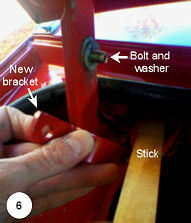 Consequently, at some time in the past, the left-hand bracket on my car parted company with its corresponding pivot-pin. I imagine it would have given the owner quite a surprise as it probably let go with a fairly loud bang. No doubt they later found the bracket lying loose in the boot, thought �Oh, another bit has fallen off my Alfa� and chucked the bracket in the bin. As mentioned previously, one functioning torsion bar is not sufficient to counterbalance the weight of the Spider boot-lid, thus handing victory in the ancient game of �Up or Down� to that old nemesis of humans: gravity. In the interest of full disclosure, I have a confession to make at this point. Not being a terribly bright sort of chap, I was not immediately aware that my Spider�s boot was defective when I acquired the car. I just assumed that the boot lid wasn�t supposed to stay up by itself. After all, the Alfasud sedan I once owned possessed no such refinements. Its small boot lid (hiding a surprisingly cavernous interior) simply hinged through 180 degrees, allowing the boot-lid spoiler to rest against the back window. Take that, gravity! So, as any real Alfa owner would do, I simply accepted my Spider�s boot-lid droop as yet another endearing quirk and simply improvised. My Stick began as an offcut from one of my woodworking projects, but after cutting it to the required length, it was magically transformed from scrap timber into a Stick. Apart from that, it was left in its raw, unrefined state, another important characteristic of a Stick. If a Stick gets too fancy � sanded or painted, for example � it can no longer be called true Stick and must be given a fancy name such as Prop, Strut or Brace. Take for example, the walking cane I got for my 50th birthday. While it shares many characteristics of a Stick, it has been pimped to the point where it can�t be described as anything other than a elderly gentleman�s perambulatory assistance device. It even has a siren and headlight. Although its primary purpose is to keep old blokes like me from falling over, I have much greater plans for it. I intend setting up a rocking chair on my verandah and sitting there waving the perambulatory assistance device menacingly at the young hooligans in the neighbourhood as they roar past in their hotted-up Hyundai Excels. Only problem with this plan so far is that my own particular neighbourhood seems to be a bit short of young hooligans. And, in any case, I live in a cul-de-sac, which rather lessens the chance of a drive-by. Anyway, the Stick in my Spider�s boot provided sterling service for several years, holding the boot-lid open when required and doing an equally good job not holding the lid open when not required. Admittedly, there was one time when the Stick slipped and I felt the full weight of the boot lid on my balding noggin, but it would be uncharitable of me to blame the Stick entirely. I may, in fact, have nudged it. If I can digress for a moment from the main topic of this article (what main topic you may ask!) I must add that the boot area of my Spider is treated with great respect. As every Spider owner knows, the Kamm-tail cars suffer from a slight structural weakness in the rear area which can result in panelwork creasing over the rear wheel arches if heavy loads are carried in the boot. My car is quite original and has not yet been subjected to the necessary surgery that inserts a strengthening bracket underneath the bodywork, above the rear axle. Accordingly, I only carry light loads in the boot so as to minimise the chance of worsening the slight distortions in the panels that invariable exist in many Kamm-tails. On the positive side, I still have the characteristic and delightful Spider cornering bum-shimmy that results from a flexible rear end. Sometimes it feels good to shake your booty! Having observed that other Spider owners seemed to have no need of either a Stick or a third hand when interacting with their boot-lids, I concluded that they either had magic boot-lids or that my car was lacking something in the holding-the-boot-lid-up mechanism. This I confirmed by the simple process of sticking my head in the boot and inferring the intent of the brackets and torsion bars. At which point I noticed the missing bracket. Actually, I figured this out not too long after I acquired the car, but with the Stick serving its purpose admirably, I added the repair to the long list of things to do. There were more important, more visible or much easier things on that do-list, so it was only recently that I got around to sorting the boot-lid. Now, because my brain works very slowly, I tend to mull over things like this for quite a while. I figured that trying to find a replacement bracket would be difficult and so I would probably need to fabricate a replacement in steel. I didn�t actually test this hypothesis about availability, so if anyone is intending to helpfully inform me that there�s a warehouse full of NOS Spider boot brackets somewhere, then I politely request that you keep that gem of information to yourself. Because I went to a lot of trouble to fabricate new ones. After close observation of the remaining bracket and its interaction with the torsion bar, I felt that the replacement bracket should probably be a bit heavier gauge than the existing bracket. The original brackets were made from 3mm steel, but even so, I noticed that the torsion force still managed to twist and bend the bracket, which it turn contributed to the wear on the rivet head. I also decided that the amount of crank in the bracket should be increased to allow for better alignment with the end of the torsion bar and reduce the levering force on the end of the pivot-pin. I realised that I would have to do something about the bracket pivot-pin itself. The pin that had held the missing bracket was cactus; once a peened-over rivet-head is broken off, it�s rather difficult to use the rivet again. So, I would need to drill that out and replace it with an 8mm bolt. 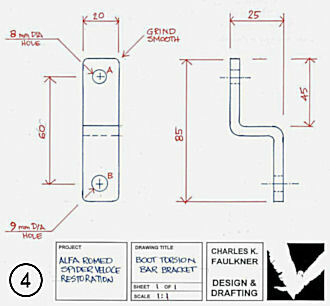 After some careful measuring I produced a sketch of my new bracket (Figure 4) that I could give to a local fabrication shop. Before that, however, I made up a prototype out of an offcut of thin sheet steel to check the fit and clearance. No doubt, many of you may have been quite happy to whip up a few of these brackets yourself in your workshop, but my meagre fabrication skills don�t extend past woodworking. I am more than happy to cut, rout, sand and plane timber - give me a pile of wood and I will happily turn it into a set of shelves, a table or a cabinet. To me, timber is a very forgiving medium, imbued with warmth and character, but metal is a harsh and unforgiving mistress. So, I faxed off my sketch to a few local fabricators for quotes and subsequently, for a couple of dollars each, had four brackets made up to my specification. I had already decided I would replace the �good� bracket on my Spider as it was only a matter of time before the pivot-pin failed in the same manner as its partner. I still have two spare brackets, in case anyone out there needs some. I cleaned up the brackets with a file, smoothing the corners and removing any burrs. Using spray cans, I cave them a coat of primer, then a couple of coats of epoxy enamel. As luck would have it, the standard �Killrust� red is a very close match to the colour of my Spider; certainly good enough for this sort of job (Figure 5). Once the paint had well and truly cured (about a week) I went about fitting them. I started on the left side, which was already missing its bracket. First order of business was drilling out the useless pivot-pin, not the easiest of tasks. Using a 4mm bit, I drilled a pilot hole, then opened it up with an 8mm bit to take the 8mm high-tensile bolt. I kept the drill bit and bracket lubricated with oil to keep the contact point cooler, but even so it was hard going and pretty much blunted the bits. After deburring and cleaning up the hole, the bolt was inserted, then a washer, then the bracket, then another washer and finally a nyloc nut. As can be seen from the photo, the trusty Stick (Figure 6) came in handy as a lever under the torsion bar to allow the bracket to be worked over the free end of the bar and the hole in the bracket to be lined up with the bolt. Such a versatile tool! With the left bracket in place (Figure 7), it was time for a test. Lo and behold, the boot lid stayed up all by itself! In fact, the lid stayed open at any angle it was put, so well did the torsion-rod system counterbalance the weight of the lid. With the left side sorted, it was time to attack the right side. The existing bracket was levered off the end of the pivot rivet without needing too much force, indicating it was fairly worn anyway. 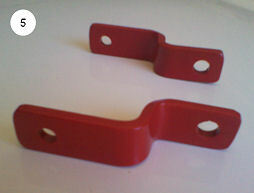 The Stick was used once again to relieve the tension on the torsion rod as the bracket came loose. The rivet was drilled out again, this time costing me a broken drill bit as it grabbed unexpectedly when I pressed a little too enthusiastically. I repeated the process with bolt washers and nyloc nut, then again checked the operation of the boot to confirm everything was in order. All that was left was to vacuum the boot to clean up any swarf from the drilling and give the brackets a small squirt of silicon spray to forestall any speaks. I can now hold my head up high, not to mention the boot-lid, whenever I am out and about with other Alfisti. And the Stick? Its job done, it is enjoying a well-earned rest as just another �bit of wood� until the next time it is needed.